Maximum withdrawal is capped at $100. At first look, you’ll see that Raging Bull Casino pulls you straight into the best parts of this online casino. There are a bunch of pokies to kick start your day, with new games up front and the option to switch across to different table games, video poker and other games too. Best of all, it caters to Australians! You’ll see some of the most lucrative bonuses on the homepage in a rotating banner that changes quite often, as well as a slick menu at the top of the screen that will get you to where you need to go. Raging Bull Casino has been in operation since early 2014 and uses only Real Time Gaming (RTG) software, which seems a little limiting in terms of volume, but you’ll be able to find your favourite games quite easily. Many sites these days like to use more than one operator for their casino software, but it’s still an accepted practice for popular online casinos to have just the one. In Raging Bull’s case, Real Time Gaming (RTG) is the choice and in it, offers a fair amount of variety. With RTG you’ll experience some of the more popular games that most casino players and gamblers expect. In doing our Raging Bull Casino review we found online pokies, roulette, blackjack and video poker too. There are also a few games in the “other” category that consist of some unique slot games. The front page of the site will show casino goers exactly what they’re getting when heading for a Raging Bull Casino sign up. 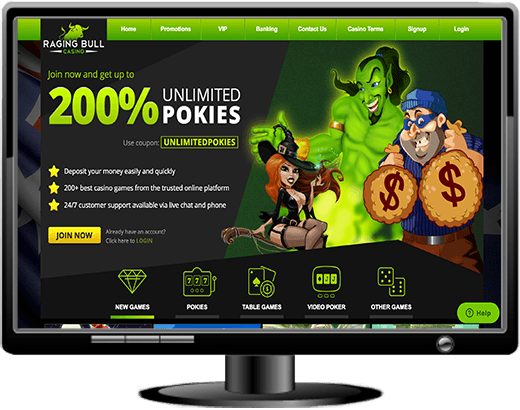 You’ll initially be presented with the Raging Bull Casino login page where you can quickly join, but you’ll be able to browse around the site first to see what’s on offer. You’ll find new slot titles like Stardust, Banana Jones and Panda’s Gold as well as some of the more traditional pokies like Cleopatra’s Gold, Sweet 16 and Aztec’s Millions. As far as table games go, you can try different varieties of blackjack and roulette, some Caribbean Holdem Poker and a few video slots to boot. You’ll be able to get a full experience at Raging Bull Casino Australia. Gaming on the go is always the way forward these days and things are no different with the Raging Bull Casino mobile offerings. You’ll be able to play a fair amount of the mobile games that accept instant play on any type of mobile device, including smartphone and tablet. The site offers a fully responsive mobile lobby as well as a wide selection of games and titles. You will find that you probably won’t get the same number of games as you do on desktop, but you’ll still likely be able to find your favourites. The casino offers the same bonus codes and coupons on mobile as you would normally get on desktop, and brings with it, the chance to play instant play or downloadable games on your phone. Some casinos might actually offer you apps in this day and age but they can sometimes be a little slow and the user experience isn’t exactly ideal. That’s why people use responsive sites and the Raging Bull mobile casino login does its job well. You’ll find that the games themselves, while on your phone, take up very little space as they have been trimmed down to cater to mobile users. Whether you’re using an Android or an iPhone, your bandwidth usage will be consistent. Both WiFi usage and 3G or 4G will use the same amount of data whether you’re on the move or not. There is no longer any added advantage playing from home or work on a WiFi network. As Raging Bull Casino uses RTG software, you’ll find that there are many different progressive jackpot slots around. One such game is Aztec’s Millions, the millionaire-maker. The slot itself puts you in place of an Aztec era where you spin the reels for a chance to match up the ancient symbols. You can also give progressive pokies like Spirit of the Inca or Cleopatra’s Gold a chance too. It’s not very often that you see an online casino giving out free bonuses and Raging Bull is one of the very few. You can claim a no deposit bonus code in [Year] right here, right now with Raging Bull. You can get a free $100 chip to use at the casino, while still claiming matched deposit bonuses and free spins on certain slots and games today. These bonuses and promotions are available to everyone just by signing up and can be awarded to you as soon as you start to play. Raging Bull also offers a VIP program where you’ll be rewarded with cash back where the more you play, the more you earn. Just by betting on some high stakes games means that you’ll get more points and climb faster through the VIP Tiers. MY1STFREEBIE The Raging Bull Casino no deposit bonus code will give you a free $100 chip! Raging Bull Casino offers its customer support to users 24/7 through multiple languages on a live chat service through their site. Not only that, buy you can also phone them to chat if you have something that needs immediate attention. For the other queries or questions you may have for the site, they offer an email support too. The live chat actually works rather well and we found that the questions our team asked were responded to, both quickly and accurately. The email support took a few days, but the service agents were professional and polite. The banking options at Raging Bull are quite varied and offers support to cryptocurrency users. If you’re making a deposit, you’ll be able to fund your Raging Bull Casino account with AUD quickly using both VISA and MasterCard. You’ll also be able to deposit using Bitcoin. In terms of withdrawals, you only have two options available to you. Thankfully, one of them is a wire transfer where you’ll be able to get your money in AU$ within a few days, paid directly into your account. You can also get your winnings deposited to you by Bitcoin. The Raging Bull Casino withdrawal options left a little to be desired. Our review team was a little surprised that we didn’t encounter many of the ewallets that most Australian casinos have on offer these days. Having these options missing for regular players might encourage people to go elsewhere for ease of use. There is a 48 hour pending period for withdrawals, during which any withdrawal request can be reversed. Withdrawals through wire transfer can take between 5 to 10 business days. Yes, Raging Bull Casino is definitely one for your list. It has a nice range of games to play from RTG, offers bitcoin support for those living in a crypto world and a memorable experience to boot. You’ll get quite a fair amount of promo codes and promotions when playing with Raging Bull too, so it might be the right place for you to start playing immediately.